Clovis Coin is a proud supplier of High Quality Challenge Coins and Lapel Pins, for every purpose. We create beautiful, unique coins for Fire Departments, Police Departments, and First Responders, as well as Private Businesses and Clubs. 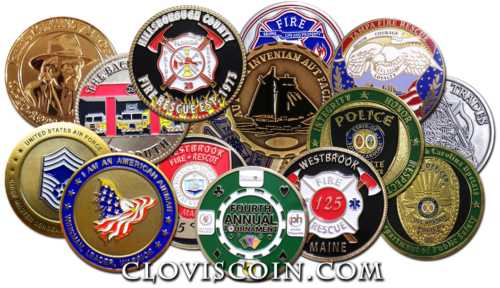 Clovis Coin, is a full service custom challenge coin manufacturer. When you work with us, you get a dedicated professional graphic designer to create your custom wholesale challenge coin, custom lapel pin, or custom bottle opener. We stand by our work, and offer some of the lowest prices and highest quality challenge coins and lapel pins on the market. Clovis Challenge Coin creates all types of challenge coins. We are proud to provide military challenge coins to all branches of the U.S. Armed Services. Our beautifully designed firefighter challenge coins and police challenge coins can be found in the hands of public service members across the country. Challenge coins can commemorate your event, your department or your agency, and Clovis Coin can provide the custom coins to meet every need. We are with you every step of the way, from concept to delivery, and after sale service. Your custom challenge coin design is part of the total price; you will never be charged extra for design. The same is true for our custom lapel pin and custom bottle opener designs. All of our design services are provided up front, at no cost, with no obligation to buy. You can be 100% sure the design is right before you place your order. You have nothing to lose! Upload any relevant artwork files.